MoneyWorks4me is a website that offers free and paid services for stock market analysis. Recently this website has launched an amazing tool for the Fundamental Analysis of the mutual funds. 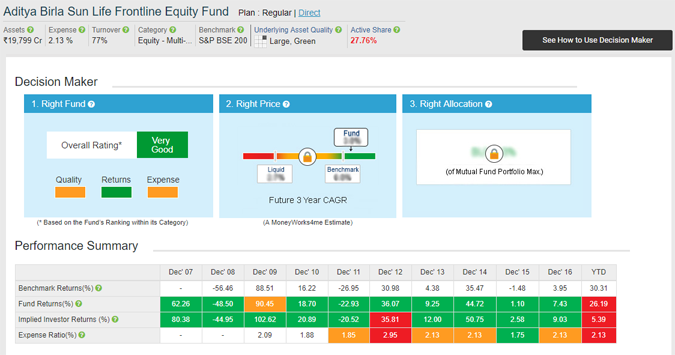 Any retail investor can use this tool free of cost to find out financial health of the mutual fund. It gives suitability of stock and mutual fund for investment along with analysis and data. Let’s take a look at What is MoneyWorks4me? How MoneyWorks4me can be used for Mutual Funds and Stock Market Decision making tool. MoneyWorks4me.com is a financial portal that empowers investors to create a wealth from the stock market. This portal offers an unbiased opinion, research, data, and tool for doing fundamental analysis. You can quickly take a right decision for investment in the stock and mutual fund. In addition to that this website also offers paid features for the advance investors. How to use MoneyWorks4me for Mutual Funds and Stock Market Investment Decision Making? First, you need to create your login account on MoneyWorks4me. It is free. In order to create a free account click on Register button. You will be prompted to input your email id, password, and mobile number. Once you input this detail click on Generate Verification Code. It will generate OTP. On entering OTP you will be able to complete registration. Once your login is created you need to login via username and password. Now follow the process given below for stock market and mutual fund decision making. On left most navigation panel you will find “Decision Maker”. It is 10 Years X-Ray feature to find if a Company is worth investing. In this tool, you will get financial performance and analysis for the stock. On clicking “Decision Maker” tab you will be redirected to a new page with a search bar. Enter the name of the company/stock in the search bar and press search button. It will display analysis of the company/stock in four parts. Value Creation – This includes last 10 years analysis of Growth parameters like sales, EPS, cash flow, profit margin etc. CAGR – This section shows CAGR data of Sales, Adjusted EPS, and Book value per share. Key Financial Parameter – In this section you will find RoE, Profit Margin, Debt to Equity ratio, Working capital days etc. Management X-Ray – This section gives rating information about corporate governance, promoter holdings, transparency, and Integrity. Entire result is visually appealing as it is shown with different color coding which can be understood easily. In addition to above, it clearly gives an indication that stock is good for investment or not. If you want to know the right price or investment and right allocation you need to spend money as it is a premium feature and not available for free login. Overall it is a quick tool for the decision making. In order to use decision maker tool for the Mutual Funds, you need to visit Mutual Funds section. This section gives information about Right Fund, Right Price, and Right Allocation. Enter the name of the mutual fund in the search bar. Select Category, Plan type, and Scheme type. Once you are done with the selection press Go button. You will be able to see the result in four parts. Returns Performance – This section gives return performance summary of the fund. It includes last 10 year fund returns, Benchmark returns and fund expense ratio. Risk Analyser – This section identifies various risk involved with fund like business risk, valuation risk, liquidity risk etc. Portfolio Quality – Portfolio Quality section gives information about Top 10 stock holdings and sector holdings. Fund Overview – This gives fund overview, investment objective and asset allocation. It also allows you to search for the direct mutual fund. You can clearly take a decision on the right fund for investment. However, if you are looking for right price and right allocation for the investment you need to pay money as it is a premium feature. Do you use services offered by MoneyWorks4me while making an Investment? Do you think facility described above will help you?